I’ve been listening to feedback from Patrons (and consulting the Tarot) about a possible higher reward tier. Over the past several years I’ve given video chat critiques for people around the country; advising on their creative goals. These sessions happened when the person reached out, asking for feedback on comics, animation, storytelling methods, and general workflow solutions. I enjoy offering what advice I can, when someone asks for it. For the past 5 years, whenever people started deciding I was “successful” and writing me emails, I’ve tried my best to push them in helpful directions through a series of conversations. So now I’m offering this service officially. A one hour Skype or Google Hangout session, once a month to workshop wherever you are in your creative process. You can bail on it whenever you want. If you just want one session, then just do one and then lower your pledge. If you want to continue workshopping stuff with me, then we can have an ongoing dialog and critique that could help you in the long term realization of whatever you’re trying to accomplish. It’s very open ended. Message me about what you want to workshop, and the sort of feedback you’re looking for. If I think I can help you out, then we can schedule an online meetup! I’m limiting this reward tier to 12 people. If it proves mutually beneficial (as the Tarot is telling me) then I’ll keep doing it! are critiques limited to visual arts? i know youre also a musician and i personally would love the chance to have a more general discussion about the arts and the purpose of creating and what motivates people to create. Also it would be awesome to get your opinion on my music, though i dont want to burden you with the yolk of my insecurities, i just think it would be cool. I’ve been practicing my drawing semi-seriously for about a year and a half but got a lot more critical about it over summer. I am barely reaching a place I feel I can share my work with some confidence but if you feel you want to connect with some more experienced peeps, then maybe I’ll hold back. Don’t sell yourself short. “Political Rap” is perhaps one of my all-time favorite AT tracks. Thanks Paul. I’m happy that “Political Rap” made it into an episode. It was sort of a running joke my friends and I had for a while, where we’d try to freestyle terrible political raps at each other. Not that I don’t enjoy my fair share of political rap! KRS One’s Edutainment is a classic! Now I’m going down a youtube KRS One hole. He was so great! Would you mind going into the specific tarot spread featured in your picture? I’ve been looking around and can’t seem to find it. Oof that would be a long explanation. On a super basic level it tells me that the exchange between myself and the consulting party will bear creative and intellectual fruit. The result will be a solid feeling of empowerment and mutual respect! Sorry, I wasn’t referring to the the specific meaning of the cards *in* the spread (which seems improper tbh), but the spread itself. Oh I see! 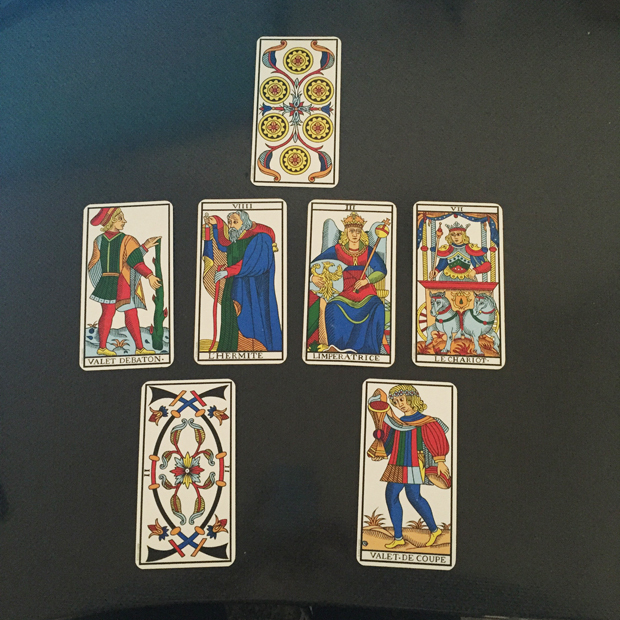 It’s a 3 card spread, open-reading style that expanded out based on my intuition and follow up questions. hi,i know this is kind of an old post and stuff,and i wanna know if it is still possible for me to talk with you.i was thinking about one session. also,i´m from brazil and i´m 16,so my english is not perfect. i admire a lot your work and it´s my dream since i was little to become an animator,so i think it could be something positive.i do feel like you understand a lot about what i am experiencing right now,so i think my questions would not be just about art,but how to deal with emotions and express them in that way,and how to keep working and having ideas even in bad moments of life.also,if you could take a look at my work it would be awesome.i´m arthur,by the way.